William Smith (1797-1882), pioneer settler of Lowndes County, GA, homesteaded on land lot No. 50, 11th District along the Withlacoochee River in the 1820s. Smith would serve as clerk of the court, postmaster, and Ordinary of Lowndes County. This section was then truly a wild southern frontier of the young American nation, replete with wild animals, panthers, bears, wolves, and snakes; Indians who resented the forceful and often illegal intrusion of settlers on to their native lands; and many febrile diseases, typhoid, malaria, scarlet fever, and other little understood diseases among them. Through this wilderness in 1823, General Coffee cut a military thoroughfare into north Florida. The Coffee Road opened up the territory and led to the creation of Lowndes County by an act of the legislature on December 23, 1825. It was around this time that the Knights first came to Lowndes county and settled in that portion which was later cut into Berrien County. The first Courts and first elections in Lowndes County were held at the house of Sion Hall, who built an Inn on the Coffee Road. But soon the commissioners of Lowndes County appointed to determine the location of the county courthouse chose William Smith’s place on the Withlacoochee as the site of the county seat, and named the place Franklinville, GA.
Lowndes at that time included most of present day Berrien County, and Lanier, Cook, Tift, Brooks, and Echols, besides. For a time the post office for this vast frontier county was at the home of Big Thumb Daniel McCranie. However, On July 7, 1828, the Post Office Department established a post office at Franklinville and appointed Mr. Smith as postmaster. William Smith, “Uncle Billy” as he was known, kept an inn at Franklinville in addition to his official duties. Uncle Billy was a member of the State Rights Association of Lowndes County, GA, along with Levi J. Knight, Hamilton Sharp, Aaron Knight, Jonathan Knight, John Knight and William Cone Knight, Noah H. Griffin, Martin Shaw, Malachi Monk, Captain David Bell and many others. The Association gathered at the county courthouse at Franklinville in 1835 to toast State Rights. Just a few years after its founding, Franklinville was found to be unsatisfactory as the seat of Lowndes county, although a legal announcement in the November 7, 1837 Milledgeville Southern Recorder, pg 4, documents that public auctions were still being held at Franklinville at that date [The same page announces auctions at the courthouse at Troupville] . William Smith moved to Troupville where he continued to serve as Postmaster. In 1837, he was also serving as the guardian of the orphans of James Baker. There, he also operated “Tranquil Hall,” one of the three hotels in the town. Tranquil Hall was widely famed for its hospitality, and when court was in session at Troupville, the judge and lawyers usually stayed at the tavern. According to an South Georgia Watchman, September 1, 1858 editorial, it was the only thing in Troupville worth bragging about. Tranquil Hall was situated on the public square, along with the court-house and jail, the stables belonging to the stage line and a convenient “grocery.” The other inns were the Jackson Hotel , situated on the town square and run by Morgan G. Swain and his wife, and a hotel operated by Jonathan Knight for eight or ten years until he moved away to Appling County about 1849. Troupville itself would suffer the same fate as Franklinville. When the Atlantic & Gulf railroad (later the Savannah, Florida & Western Railway) came to Lowndes County, it bypassed Troupville, following a route four miles to the south through the site now known as Valdosta, GA. The first train rolled into Valdosta in July of 1860. The railroad was in process of building when residents of Troupville began to move. William Smith, one of the pioneers, and known as “Uncle Billy” Smith, the day the deed was signed by Mr.Wisenbaker giving the railroad six acres of land on which to build the first station, tore off the wing of his hotel at Troupville and moved it to Valdosta, where he operated his hotel several years. The first house moved to the new town was owned by Judge Peeples and it was rolled from Troupville to Valdosta, being placed on pillars on the lot on Troup street where it now stands. Several other houses were also moved bodily and some few of them are yet standing. In a few weeks time Troupville as a town was no more. Advertisement for Tranquil Hall, upon its relocation from Troupville, GA to Valdosta, GA, 1870. 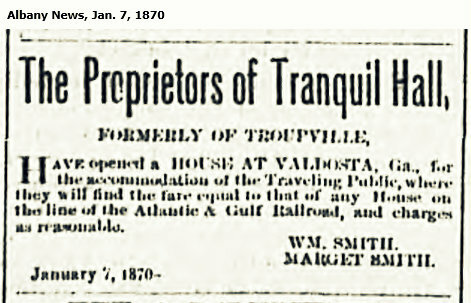 The Proprietors of Tranquil Hall, formerly of Troupville, have opened a house at Valdosta, Ga., for the accommodation of the Traveling Public, where they will find the fare equal to that of any House on the line of the Atlantic & Gulf Railroad, and charges as reasonable. Uncle Billy and his wife Margaret continued to operate Tranquil Hall at Valdosta, GA. Eventually, in their declining years they sold out to Darius M. Jackson. Death Of “Uncle Billy” Smith. When Lowndes was made a county the county site was located at Franklinville, (Mr. Smith’s home,) and he was elected Clerk of the Court. An interesting account of the first court held was published in these columns about a year ago from his pen. Later, the county site was moved to Troupville and there Mr. Smith kept a hotel. “Tranquil Hall,” as it was known, was noted for its hospitable landlord and lady and for its splendid table. Travelers carried the good name of this country inn far and wide. “Tranquil Hall,” with Troupville, was moved and helped to make Valdosta, when the Gulf Road came through here; but the hotel declined with the old people and about ten years ago they gave up the business, and sold the building. It is now occupied by Mr. D. M. Jackson. Mr. Smith has more than once been Ordinary of the County, having held that office as late as twelve or fourteen years ago. He has held other positions of honor and trust, and in his prime of manhood was a leading and influential man. He had two sons, William and Henry, who died after the war, leaving families. All of Wm. Smith Jr.’s family have died, we believe, but Mr. Henry Smith’s widow, four children and one or two grandchildren are living. So Mrs. Wm. Smith, the widow of the deceased, survives all but four grandchildren and the great grandchildren. We hope the good old lady will find her remaining days as comfortable and as happy as they can be to one left alone at such an age. We would like, at some other time, to give Earthier reminiscences of the old gentleman’s life, if we can get hold of the data. Mr. Wm. Smith. Christian Advocate. William Smith died in Valdosta recently in the eighty-fifth year of his age. I have known him for over half a century. He was elected Clerk of the Superior Court of Lowndes County in the year 1827, which office he held consecutively for a number of terms, and filled other offices of trust and honor in that county. He was the proprietor of “Tranquile Hall,” located in Troupville, the then county site of Lowndes, and the house was long and favorably known as one of the best hotels in the state. The result of the late war between the States was very hard on him, as his all consisted of slave property. His life was long and varied, a true friend in every respect. He became a member of the M. E. Church South many years ago, but was not very demonstrative in his religious duties until late in life. He was a constant attendant on Church, and always enjoyed the services of God’s house. His departure was very sudden, but we have no fears as to his being well prepared for the change, which was a happy one to him. His children, one by one, all preceded him to the grave, but his wife, like himself very old, still lingers on these mundane shores. Peace be to his memory.